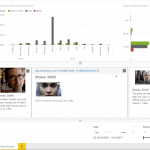 Do you extensively work with Power BI Custom Visuals? 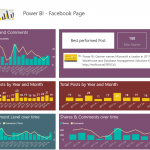 This Power BI report connects to AppSource to show all of the Custom Visuals which are publicly available for Power BI on the Marketplace. 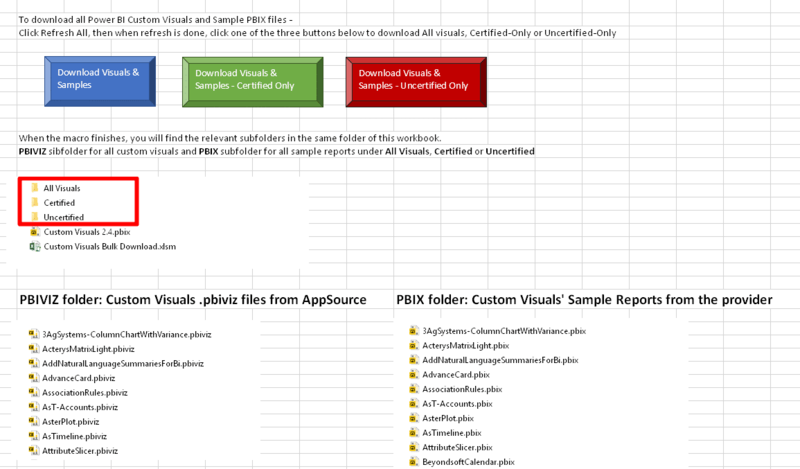 You can publish this report in your PowerBI.com tenant, for a scheduled refresh, or use the web scarping queries and automation in Excel to apply bulk downloads of all .pbiviz files and their .pbix sample reports to approve their use in your organization. Optional 6 months warranty: If you include the 6 months warranty, if your Custom Visuals report stops refreshing due to breaking changes in AppSource, I will send you an updated version. Latest version includes ceritified and uncertified Custom Visuals in the report, and automatically download all visuals, certified-only or uncertified-only. 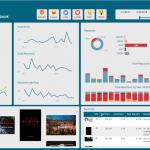 You can now buy the full Custom Visuals Governance Tools, including the new Custom Visuals Scanner, the Power BI Custom Visuals report and the Excel Bulk-Downloader. Version 2.6 includes an updated web scraping following a breaking change in AppSource. Get 50% off the Custom Visuals Scanner if you buy the full package of Custom Visuals Governance Tools. Version 2.5 includes an updated web scraping following a breaking change in AppSource that led to refresh failures in version 2.4. If you purchased the report between September 1st 2018 to October 8th 2018, contact me for an updated version. Version 2.4 provides the differentiation between certified and uncertified custom visuals. Version 2.4 enables you to bulk-download the certified visuals for deployment as organization custom visuals (learn more about organization custom visuals here). You can also bulk-download only the uncertified custom visuals, for further inspection and approval for your organization. Future changes on AppSource website may cause the refresh of the report and Excel file to fail. You can contact DataChant for a refund in such cases, but no longer than 30 days since the purchase date, or select the report with 6 months warranty.